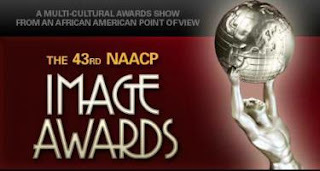 The 2012 NAACP Image Awards has revealed its movie winners during a ceremony on Friday, February 17. Claiming the top prize of Outstanding Motion Picture was "The Help", which also became the biggest winner at the night by taking home three kudos in total. The civil-rights era drama also brought its actresses Viola Davis and Octavia Spencer to win the awards for Outstanding Actress and Supporting Actress respectively. Meanwhile, the actors from "Jumping the Broom", Laz Alonso and Mike Epps, took home the Outstanding Actor and Supporting Actor respectively. Angelina Jolie's directorial debut "In the Land of Blood and Honey" was awarded with Outstanding Foreign Motion Picture prize, while Dee Rees' acclaimed drama about lesbian teenager, "Pariah", grabbed the Outstanding Independent Motion Picture award. During the ceremony, veteran filmmaker George Lucas was honored with the Vanguard Award after presenter Samuel L. Jackson described him as "the man, the myth, the legend." Lucas received the special prize for his work in "Red Tails", which he dubbed as an inspirational and patriotic film to "show that everybody has contributed to building this country into what it is today." The 43rd NAACP Image Awards was held at The Shrine Auditorium in Los Angeles. The ceremony, which honored diversity in the arts, also paid tributes to the late Whitney Houston by screening footage of Houston accepting the Image Award for outstanding female artist in 1994. In addition to movie winners, the prize-giving show announced its winners in TV as well as music fields. "Law & Order: Special Victims Unit" and "Up All Night" were among the winners in TV, while Jennifer Hudson was the biggest winner in music. Outstanding Motion Picture: "The Help"
Outstanding Actor in a Motion Picture: Laz Alonso - "Jumping the Broom"
Outstanding Supporting Actor in a Motion Picture: Mike Epps - "Jumping the Broom"
Outstanding Supporting Actress in a Motion Picture: Octavia Spencer - "The Help"
Outstanding Independent Motion Picture: "Pariah"
Outstanding Foreign Motion Picture: "In the Land of Blood and Honey"
Outstanding Documentary (Theatrical or Television): "Sing Your Song"